MARQUETTE — One local nonprofit could be the recipient of a $5,000 grant from Flagstar Bank. 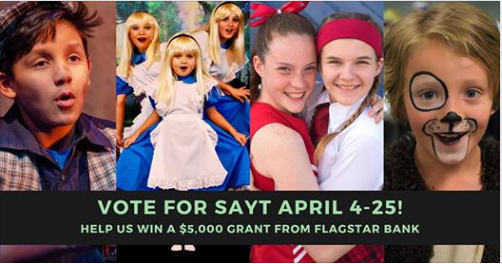 The grant comes from the “Flagstar Crafts Community” program where each of Flagstar’s 52 branches nominates nonprofits and the Superior Arts Youth Theater (SAYT) was one of the selected. Nominees are chosen based on their alignment with Flagstar’s community reinvestment objectives and the giving pillars of the Flagstar Foundation. The pillars focus on three areas: apprenticeship and workforce readiness, arts and culture, and financial capability. Although SAYT has been nominated, it’s the community’s who select the winning nonprofit by voting. The voting process has already begun and will close on April 25th. People can vote online or at their nearest Flagstar branch. Ballots submitted in person at branches will count as two votes for the nominee and online ballots will count as one vote. For online voting, click here. Those who chose to vote online will be asked to enter their zip code and will be presented with charities nominated from the nearby branch. Flagstar will contact the winning organization by mid-May.